The Homecare Administrator's Field Guide, Third Edition, is the new must-have resource for new and veteran home health administrators written by expert Robert W. Markette Jr. 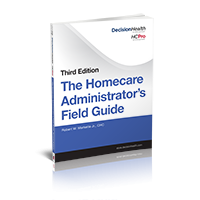 The Homecare Administrator's Field Guide, Third Edition, is the must-have resource for new and veteran home health administrators. Running a home health agency has never been more challenging. Every year brings new regulations, and you need best practices for staying compliant with ALL of them, including updated Conditions of Participation (CoP), new QAPI requirements, star ratings, OASIS-D, and annual PPS updates—and that’s just the tip of the iceberg. This book provides a strategic breakdown of the organizational structure of a home health agency and explains the administrator’s role in operations, human resources, financial management, OASIS, payment, public reporting, and regulatory compliance. Sprinkled with CMS citations so you know exactly where the guidance is coming from, this book can aid an administrator or department manager in creating new and more efficient programs. Written by expert Robert W. Markette Jr., home health attorney for Hall, Render, Killian, Heath & Lyman, PC, this one-stop guide helps you save time by clearly and concisely covering all of the duties and responsibilities of home health administrators. 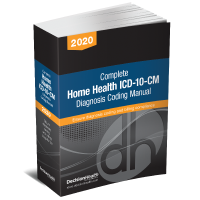 It includes lessons learned from the field and special home health considerations.